What a great way to start off the new year with a Grand Opening! 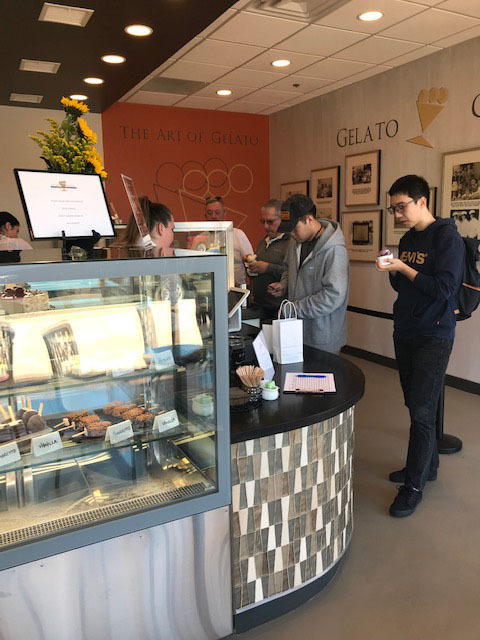 My design client, Gelato Granucci opened their doors with a “soft” Opening on January 3, 2019 and held their Grand Opening on Saturday, January 19th in Palm Springs, CA. It was a deliciously exciting day! 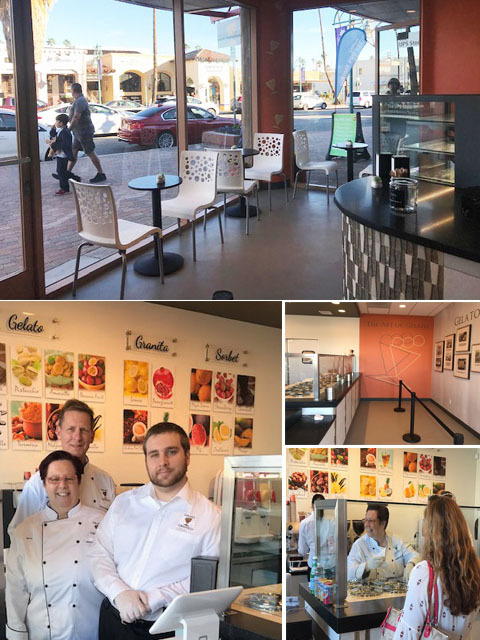 Looking back at Dezine Bytes # 8, “La Dolce Vita!” Life is Sweet in Downtown Palm Springs Designing New Gelato Granucci Store, Part 1, which showed the preliminary interior design concepts, here in Part 2, you can now see the design concepts implemented: from the mosaic tile service counter to the honed finish granite counter tops, adding the final touches with the Gelato Granucci ‘logo’ wall graphics and the Granucci family history display. It was a pleasure to work on this design project. The design plays an important role in any environment but it is the exceptional service and love the owners have for their gelato and customers… and of course the ‘artisanal’ gelato itself that will sustain the good reputation and ongoing success of Gelato Granucci! 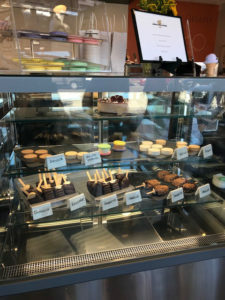 Their fresh, made on-site, authentic Italian gelato, sorbet and unique bakery goods are so good. 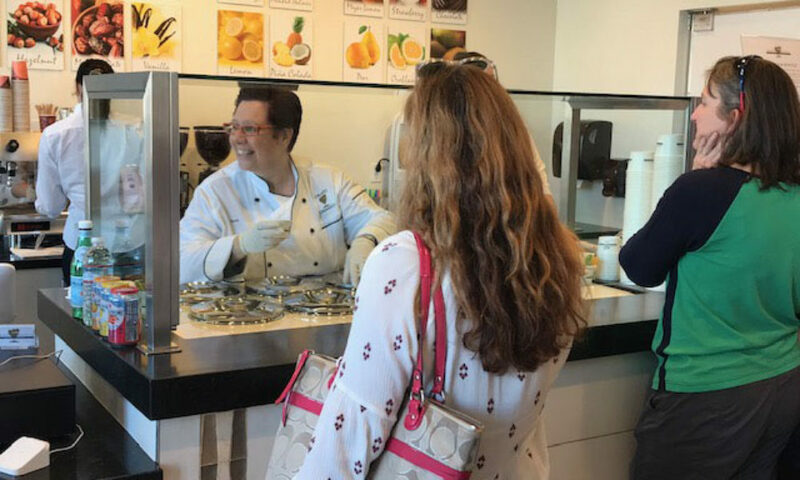 Whether you are a Palm Springs resident or a visitor, it’s a MUST to visit Gelato Granucci to taste the Art of Gelato at it’s best! We hope Dezine Bytes will also stimulate your appetite for design creativity! Designing is a creative adventure in making the best design choices for how you live, work and play today and what you may envision for tomorrow. Christina Higuchi is Interior Designer/Owner at Dezine Refined – Interior Design For Good Living in beautiful La Quinta, California. “Dezine Bytes” and “Interior Design For Good Living” are Dezine Refined Trademarks. ©2019 Christina Higuchi, Dezine Refined. All Rights Reserved.